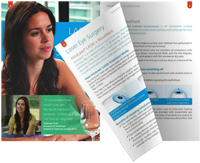 The 15 minutes procedure to banish glasses and contact lenses. Are you tired of fumbling for glasses in the morning, or dealing with contact lenses on the beach or at the swimming pool? If you are, then you could benefit from an affordable, advanced eye treatment. Laser eye surgery can eliminate the hassle of glasses and lenses, and give you crystal-clear vision in a quick and painless procedure. As well as looking and feeling better, you’ll notice that your bank balance is healthier in the long-term, too. No more costly visits to the optician for new spectacles, or monthly contact-lens subscriptions. And, thanks to the range of affordable payment options available, you don’t have to wait to enjoy great, natural vision. Millions of people worldwide have improved their lives with this amazing procedure – and new technology means that even those with complex or extreme prescriptions can benefit. Free No-Obligation Consultation Includes your FREE EyePredictTM Results Forecast, exclusively available at Optimax. Payment plans are available for every budget. Over 99.8% of all patients treated at Optimax achieve driving standard vision or better. We provide you with all necessary aftercare for as long as you need it.